The standard model of the universe has it that the energy density of its contents and the 'dark energy' of its expansion are, just now, of the same order of magnitude. Coincidence? Credit: NASA. Cosmologists tend not to get all that excited about the universe being 74% dark energy and 26% conventional energy and matter (albeit most of the matter is dark and mysterious as well). Instead they get excited about the fact that the density of dark energy is of the same order of magnitude as that more conventional remainder. After all, it is quite conceivable that the density of dark energy might be ten, one hundred or even one thousand times more (or less) than the remainder. But nope, it seems its about three times as much  which is less than ten and more than one, meaning that the two parts are of the same order of magnitude. And given the various uncertainties and error bars involved, you might even say the density of dark energy and of the more conventional remainder are roughly equivalent. This is what is known as the cosmic coincidence. To a cosmologist, particularly a philosophically-inclined cosmologist, this coincidence is intriguing and raises all sorts of ideas about why it is so. However, Lineweaver and Egan suggest this is actually the natural experience of any intelligent beings/observers across the universe, since their evolution will always roughly align with the point in time at which the cosmic coincidence is achieved.  Inflationary era  a huge whoomp of volume growth driven by something or other. This is a very quick era lasting from 10-35 to 10-32 of the first second after the Big Bang.  Radiation dominated era  the universe continues expanding, but at a less furious rate. Its contents cools as their density declines. Hadrons begin to cool out from hot quark-gluon soup while dark matter forms out of whatever it forms out of  all steadily adding matter to the universe, although radiation still dominates. This era lasts for maybe 50,000 years.  Matter dominated era  this era begins when the density of matter exceeds the density of radiation and continues through to the release of the cosmic microwave background radiation at 380,000 years, when the first atoms formed  and then continues on for a further 5 billion years. Throughout this era, the energy/matter density of the whole universe continues to gravitationally restrain the rate of expansion of the universe, even though expansion does continue.  Cosmological constant dominated era  from 5 billion years to now (13.7 billion) and presumably for all of hereafter, the energy/matter density of the universe is so diluted that it begins losing its capacity to restrain the expansion of universe  which hence accelerates. Empty voids of space grow ever larger between local clusters of gravitationally-concentrated matter. And here we are. Lineweaver and Egan propose that it is unlikely that any intelligent life could have evolved in the universe much earlier than now (give or take a couple of billion years) since you need to progressively cycle through the star formation and destruction of Population III, II and then I stars to fill the universe with sufficient metals to allow planets with evolutionary ecosystems to develop. The four eras of the universe mapped over a logarithmic time scale. 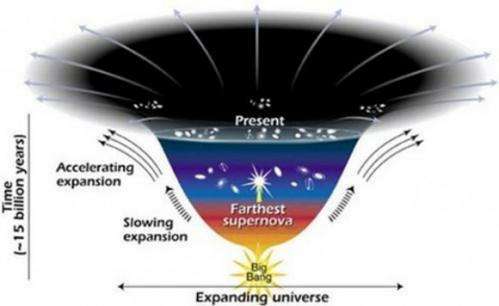 Note that "Now" occurs as the decline in matter density and the acceleration in cosmic expansion cross over. Credit: Lineweaver and Egan. So any intelligent observer in this universe is likely to find the same data which underlie the phenomenon we call the cosmological coincidence. Whether any aliens describe their finding as a coincidence may depend upon what mathematical model they have developed to formulate the cosmos. Its unlikely to be the same one we are currently running with  full of baffling dark components, notably a mysterious energy that behaves nothing like energy. It might be enough for them to note that their observations have been taken at a time when the universes contents no longer have sufficient density to restrain the universes inherent tendency to expand  and so it expands at a steadily increasing rate. In dense aether theory the dark matter contains the missing antimatter, so that the amount should be exactly the same because of symmetry. But I presume, the dark matter contains lotta normal matter trapped too. For example the heavily ionized atom nuclei are behaving in similar way, like the positrons and they cannot be separated each of other so easily. BTW The estimation of total amount of dark energy is based on this graf - its reliability isn't apparently quite high. Why is the universe expanding at an accelerating rate? arent we just going to glop up into black holes again somewhere down the road and pull back together to blow up again? IMO from the same reason, like the ripples are collapsing with accelerated speed at the picture bellow. From aether theory follows, at the wavelength of CMBR the Universe doesn't expand and for waves of larger wavelength it will collapse instead. The water surface ripples are behaving in the same way. This dependence makes the aether model testable. For example it has been observed, in CMBR radiation many effects of red shift disappear. The expansion model of Universe suffers with many problems. Recently the astronomers found many well developed galaxies at the distance, in which the Universe was just some 600 million years old. Such young universe shouldn't contain stars with such high degree of metalicity, because the synthesis of heavier elements takes time. Instead of this, the lighter elements like the lithium are missing in early Universe. The remote galaxies appear larger, then the close ones. If our Universe would expand, the older galaxies should be smaller instead. The astronomers still didn't observe the blue shift for radiowaves, particularly because of the lack of proper sources of reference wavelength. But the aether theory predict violation from inverse square law, too. In accordance with it it has been observed, the intensity of distant radiowave sources is 6x higher, than it corresponds their distance. @Callippo - Can you clarify that final link of yours? I don't think that can be called representative of a lack of evidence of blueshift in the early universe (something that is to my knowledge we have relatively concrete evidence for). While the link you have produced is certainly interesting data wise, I just don't see how this calls into question early universe blueshift. In 'Stalking the Wild Pendulum', the author proposed the universe will curl back to its source. Hi nxtr, I think you are referring to the '80's theory of Big Bang/ Big Crunch. This cosmological model has fallen out of favor due to better understanding of our current universal expansion. Simply put there is not enough matter or gravity to elicit a Big Crunch. I'm not a scientist but I am a 40 white guy who grew up on Big Bang/Big Crunch with Sagan. Any book by Brian Greene will bring you up to speed quickly and easily into this era. The Anthropic principle is an argument for weak minds trying to fit the Universe into the elaborate model of their own navel. Douglas Adams used the metaphor of a living puddle examining its own shape, since, to those living creatures, the universe may appear to fit them perfectly (while in fact, they simply fit the universe perfectly). To quote Penrose again: "it tends to be invoked by theorists whenever they do not have a good enough theory to explain the observed facts." As such, they are criticized as an elaborate way of saying "if things were different, they would be different," which is a valid statement, but does not make a claim of some factual alternative over another. Looks to me like someone needed to get an article published, and maybe hope for a book deal. The dark matter we see is simply the matter in the other universe, which does not have exactly the same parameters, and therefore not the same laws. "Mirror particles have therefore been suggested as candidates for the inferred dark matter in the universe"
Empty voids of space grow ever larger. they would be different," which is a valid statement, but does not make a claim of some factual alternative over another. We observe intelligent life - therefore the universe is capable of hosting intelligent life. This does not put a limit on what other forms the universe could have (nor does it suppotr any claim that the universe MUST be a certain way so as to suppotr life or that it is even more likely to support life than not). However it negates the notion that the universe cannot host life. I.e. there is an entire set of possibilities in search space (or as Penrose puts it 'phase space' ) which cannot be excluded. Whereas for the other types (some universes which don't support life) we don't know whether some of that search space can be excluded or not. This is very little information but it is not no information. The problem with getting information from the distant universe, is that the light we receive is far less than the light we receive from the near universe. We can not observe the bright stars of the sun's size issue and therefore we do not know about the distant galaxies contain the same types of star as our own Milky Way. It is only the brightest starlight we observe from the most distant galaxies and that light comes mostly from young stars. Therefore, we normally come up to the conclusion that the most distant galaxies are young galaxies. Our understanding of the universe from the most distant areas, is only based on information which is extremely small. More uncomfortable features to fit into the Big Bang Fantasy (BBF). Observerd red-shift imbalance support tired-light models? 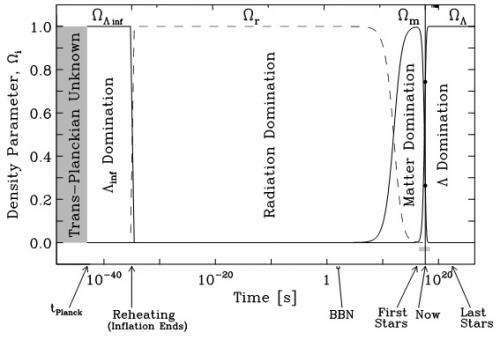 Forever increasing dark energy violates thermodynamic laws? Like in Texas, it's the LAW! After all, it is quite conceivable that the density of dark energy might be ten, one hundred or even one thousand times more (or less) than the remainder. But nope, it seems its about three times as much which is less than ten and more than one, meaning that the two parts are of the same order of magnitude. I'm not comfortable with this. It's like saying a car is the same size as a bus because you measure them both in metres. If you expressed their sizes in binary, a truly universal counting system not based on the number of fingers the inventors possess, then the orders of magnitude (OOM) are not the same. I think up to double the quantity should qualify as same OOM but any more than that should not. Sorry. Double post. Internet dropped out.